To be a really chewy, soft tortilla, these need much more lard/shortening - at least 1/2 cup. 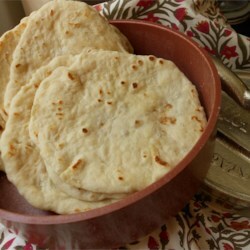 Following, this recipe exactly I ended up with very brittle, tasteless tortillas that didn't bubble up well in the pan. I did a bit more research and found a video recipe by Food Wishes - it's the money!